Ramen noodles are a staple on college campuses and kitchens of the less well-to-do because they cost about $1.64 for a three month supply. Although they are cheap, I still think they're tasty. I am willing to buy cheap noodles, but lunch meat, well, that's another story. I'll just say I'll never buy bologna at the Dollar Tree - which is exactly where I purchased the ramen noodles I used in this delicious recipe. I wanted to use the noodles as a substitute for rice in a simple stir fry I was putting together as a dish for around twenty people. I kept it very simple – four ingredients. I could have added more but this was really one of those situations where I thought I could come up with something that even the most inexperienced cook could make and be proud of their creation. I'm pleased to say that this recipe was not just a simple dish for a simple cook, but a simple dish with rock star flavor! I inhaled a bowl of this after it was finished. This is a great item to have on the counter for a weekend meal. 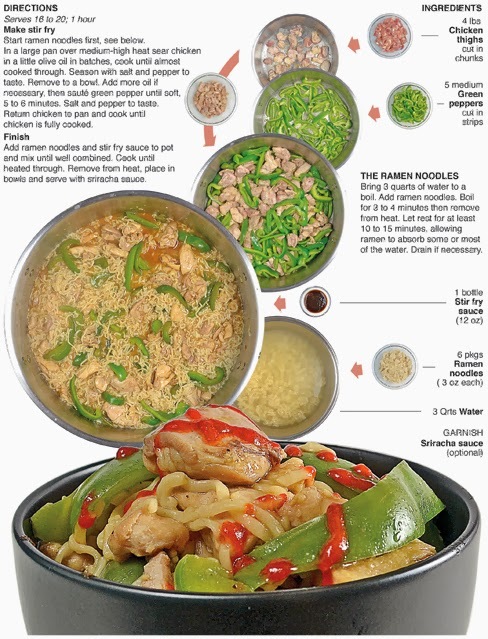 I loved eating ramen noodles when I was in college and I still enjoy them today – who cares if they are a poor man’s food – they’re delicious and seem to absorb just about any type of flavor they're surrounded by. 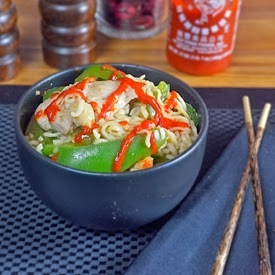 I made a spicy ramen soup a while ago and it, along with this, are two of my favorite noodle recipe from the past year. I decided to make a ramen dish after my last pantry purge. A few weeks back I was putting away groceries and was having trouble finding room for a can of soup. I knew I had to get rid of some things. One of the items taking up space was a near-full 12-pack box of ramen noodles. When I volunteered to make a dish for a gathering at the local church, I knew I could wipe out most of the noodles. I used 6 packages, but still have another four left from a $1 box – they have to be the most economical food of all time! Bring 3 quarts of water to a boil. Add ramen noodles. Boil for 3 to 4 minutes then remove from heat. Let rest for at least 10 to 15 minutes, allowing ramen to absorb some or most of the water. Drain if necessary. In a large pan over medium-high heat sear chicken in a little olive oil in batches, cook until almost cooked through. Season with salt and pepper to taste. Remove to a bowl. Add more oil if necessary, then sauté green pepper until soft, 5 to 6 minutes. Salt and pepper to taste. Return chicken to pan and cook until chicken is fully cooked. 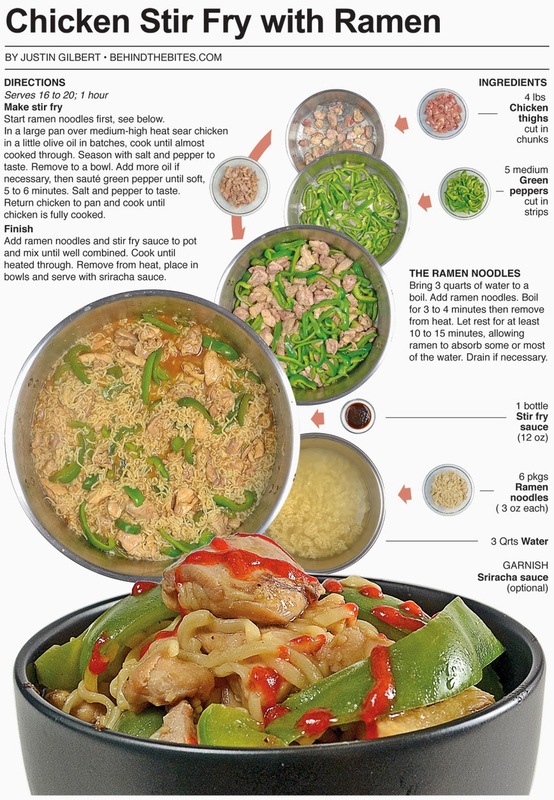 Add ramen noodles and stir fry sauce to pot and mix until well combined. Cook until heated through. 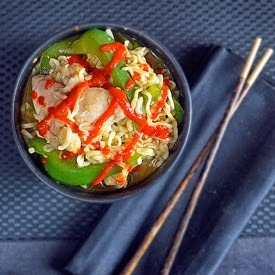 Remove from heat, place in bowls and serve with sriracha sauce.